Congratulations to Julie Hsiao for her Best Paper Nomination at DATE 2018 for the paper: "Sensei: An Area-Reduction Advisor for FPGA High-Level Synthesis". Congratuations to Joy Chen for her Best Paper Award at FPL 2017 for the paper: "Automated Generation of Banked Memory Architectures in the High-Level Synthesis of Multi-Threaded Software". This award is for authors who have made a significant contribution to the community by providing some material or knowledge in an open format that benefits the rest of the community. 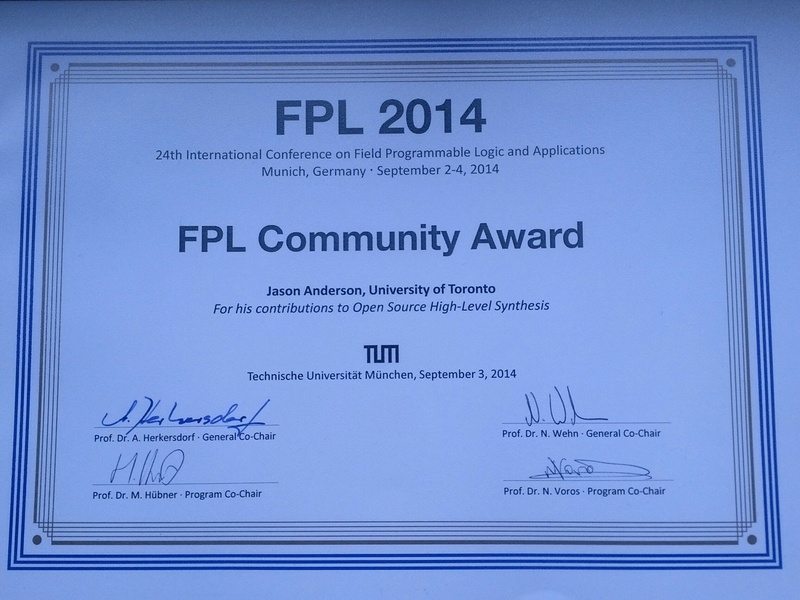 We sincerely thank the FPL community for the recognition. O. Ragheb, J.H. Anderson, "High-Level Synthesis of FPGA Circuits with Multiple Clock Domains," IEEE International Symposium on Field-Programmable Custom Computing Machines (FCCM), Boulder, CO, April 2018. S. Bansal, H. Hsiao, T. Czajkowski, J.H. Anderson, "High-Level Synthesis of Software-Customizable Floating-Point Cores," IEEE/ACM Design, Automation and Test in Europe Conference (DATE), Dresden, Germany, March 2018. J. H. Kim, B. Grady, R. Lian, J. Brothers, J.H. 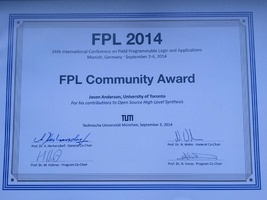 Anderson, "FPGA-Based CNN Inference Accelerator Synthesized from Multi-Threaded C Software," IEEE Int’l System-on-Chip Conference (SOCC), Munich, Germany, September, 2017. Q. Huang, R. Lian, A. Canis, J. Choi, N. Calagar, R. Xi, S. Brown, J.H. Anderson, "The effect of compiler optimizations on high-level synthesis-generated hardware," to appear in ACM Transactions on Reconﬁgurable Technology and Systems (TRETS), 2014.